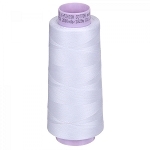 This 100% cotton thread is great for any cotton creation. It has a luxurious-soft effect with high breaking resistance . As with all silk finish weights, it is color fast.